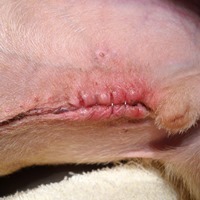 Ashley Magee, DVM, DACVS, discusses a case study of a gastroduodenal perforation in a canine that was treated with concurrent steroids and NSAIDs. An elderly Golden Retriever from out of state was presented for evaluation of abdominal effusion and possible surgery. The patient had a history of osteoarthritis and was being managed chronically with deracoxib. One week prior, she was seen by a dermatologist for a skin flare-up and was prescribed methylprednisolone, ketoconazole and hydroxyzine. Two days prior to presentation, she started vomiting and passing black tarry stool. Abdominal radiographs taken at the referring hospital demonstrated free peritoneal fluid and gas. On presentation to DoveLewis’s emergency room, the patient was weak but ambulatory. She was tachycardic and painful on abdominal palpation, with a ballottable fluid wave. Digital rectal exam yielded hematochezia. She was estimated to be 7% dehydrated. Other physical parameters were within normal limits other than muscle wasting in the hindquarters and bilateral medial stifle buttressing. Clinical chemistry abnormalities included hypoproteinemia, hypoalbumenemia, anemia, leukopenia and neutropenia as well as an elevated ALT. The patient’s clinical presentation and history of concurrent steroid and NSAID use was consistent with perforated gastrointestinal ulcer. Emergency abdominal exploratory was recommended. At surgery, the diagnosis of septic peritonitis was confirmed (figure 1). A 1 cm diameter full-thickness ulcer was present on the ventral aspect of the pylorus (figure 2). The abdomen was contaminated with ingesta and bile. The ulcer was resected and the area closed primarily (figure 3). Extensive lavage and debridement was performed to remove and dilute inflammatory mediators, bacteria, bile, and organic debris (figure 4). Samples were taken for aerobic and anaerobic culture. 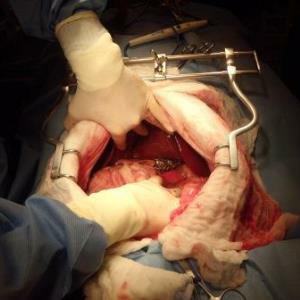 An omental patch was placed around the resection site for healing augmentation. 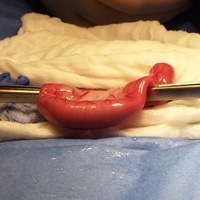 Two closed suction drains were placed in the abdomen to provide continuous drainage, quantitate abdominal effusion, and evaluate peritoneal fluid for presence of bacteria post-operatively. Figure 1. Septic peritonitis as evidenced by accumulations of green stained fibrin in the area of the pylorus and marked erythema and debris on peritoneal surfaces. Figure 2. Perforated ulcer found at the level of the pylorus. Figure 3. Resected ulcer closed primarily. Figure 4. Original peritoneal exudate (right) recovered from patient and recovered lavage fluid. Post-operatively the patient was treated with IV crystalloids and colloids, fentanyl CRI, broad spectrum antibiotics (metronidazole, ampicillin-sulbactam, enrofloxacin), sucralfate, proton pump inhibitors (pantoprazole), and prostaglandin analog (misoprostol) for anti-ulcer effects, repeated plasma transfusions for hypoproteimemia, blood transfusion for anemia and continued hematochezia, oxygen supplementation, enteral feeding, and daily cytologic monitoring of abdominal effusion. Culture of the abdominal fluid from surgery isolated enterococcus and clostridia species, both sensitive to ampicillin-sulbactam. Unfortunately, eight days post-operatively, the patient’s clinical status deteriorated and abdominal effusion character abruptly changed to a septic exudate. Differential diagnoses included perforation of another site or delayed healing/dehiscence of the original site. Marked debilitation of the patient and financial exhaustion precluded a second surgery and the patient was euthanatized. This case demonstrates the potential devastating sequela of combining NSAIDS and steroids in our patients. 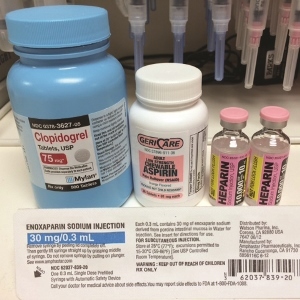 While each medication alone has the potential to cause gastrointestinal ulceration, the use of the two drug types in combination is frequently reported in dogs presenting with perforated GI ulcer at this hospital. Treatment of these patients is challenging, time intensive and expensive. Potential complications in these cases are many and include overwhelming infection/sepsis, DIC, anemia, hypoglycemia, hypoproteinemia, ileus, incisional or intestinal dehiscence, and adhesion formation. The majority of patients will experience multiple complications. Delayed intestinal healing is a common sequela due to impaired healing ability in the compromised, debilitated patient and ongoing severe inflammation in the abdomen during the initial healing phases. While some patients can recover from this type of injury and have a relatively good long-term outcome, reported survival rates are 50-60% 1,2. This statistic is in agreement with our clinical experience at DoveLewis. Clear communication between clients and clinicians is essential to avoid unintentional use of these two drug types in combination and prevent tragic outcomes as illustrated in the case example above. Whenever a patient is started on either therapy, the clinician should directly inquire with the client regarding whether the other drug class is or has been recently in use and not rely solely on referral notes or admission forms regarding medication history. Clients should be thoroughly educated in the recognition of adverse side effects so that the drugs can be discontinued and veterinary attention sought if signs such as vomiting and diarrhea occur. Clients should be informed of the potential dangers of using steroids and NSAIDS in combination or of using other NSAIDS in combination or in series without appropriate wash-out periods and veterinary supervision. 1. Hinton LE1, McLoughlin MA, Johnson SE, Weisbrode SE. Spontaneous gastroduodenal perforation in 16 dogs and seven cats (1982-1999). J Am Anim Hosp Assoc. 2002 Mar-Apr;38(2):176-87. 2. Cariou M1, Lipscomb VJ, Brockman DJ, Gregory SP, Baines SJ. Spontaneous gastroduodenal perforations in dogs: a retrospective study of 15 cases. Vet Rec. 2009 Oct 10;165(15):436-41.